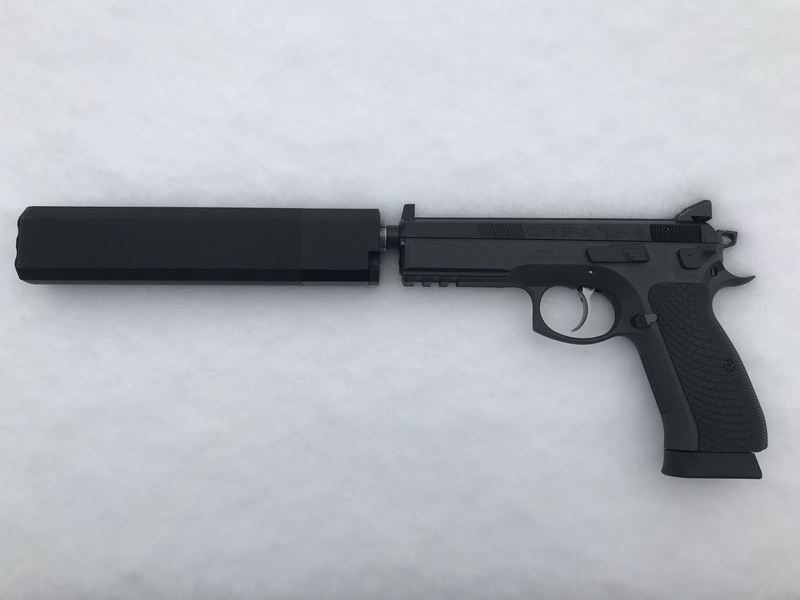 My New Custom SP-01 Tactical Threaded! Been needing a CZ pistol host for a while for my Osprey 45. Finally made the move and commissioned this baby from my buddy Chris down at CS Coatings in VA Beach. He took an urban grey 91235, stripped it down and blasted it. Refinished the slide in black and the frame in sniper gray. Added in the Cajun Pro package before putting it back together. DA is set at 6.0 with SA at 2.9. Finished her off with some Cool Hands. Couldn’t be happier with the work! Ran 400 rounds of assorted ammo through her yesterday and it is a shooter! Interestingly enough it hated the American Eagle 147s. May have to do some more polishing on the feed ramp. It ate everything else with ease and was lights out once I adjusted to the supressor sights. I am a very happy customer. Here are a few pics! Re: My New SP-01 Tactical Threaded! Gratz on your project, looks like it came out well. If i remember correctly the 147g AE bullets have a high bullet shoulder with a flat point. A shape not known to work well with the CZ barrel chamber. 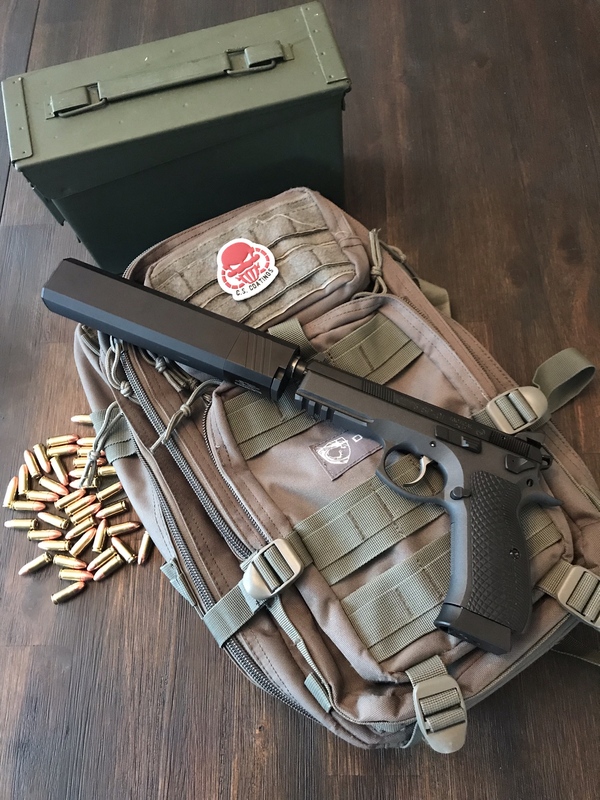 Bought one in December as a suppressor host and it is my favorite pistol PERIOD. (with and especially WITHOUT the suppressor) I have found the truncated rounds (very conical) in 147+grn AND 115grn will definitely Fail to feed. Mine devours the Fiocchi 147 subsonic. So far the Browning 147grn subsonic (yellow box) ammo holds the tightest groups in HP and Round Nose. Only downside so far is the thread protector works loose faster than any threaded pistol I own so make sure and check it EVERY magazine. Even cranking it down with a coin doesn't make it stay. I can get it to stay with a Big F%^$ screwdriver BUT unscrewing requires carrying that same massive screwdriver around with me to range so I just check it a lot! BlackRhino Concealment makes a custom Kydex for the SP01 Tactical with the threaded barrel and suppressor height sight option. (you can get it made for various weapon mounted lights also) About $80. The fix for the thread protector loosening is easy, just put an o-ring (of the proper size) inside the TP and it will not work itself loose during firing. Did you try any of the Speer Lawman 147gr and if so any feeding issues with that ammo? No Lawman. Ran boxes of Blazer 115 and 124. Syntech 147s which performed really well. The AE 147s which were a major fail. Also some Independence 115 I had leftover and some S&b 150s. Appreciate the feedback on the ammo fellas! 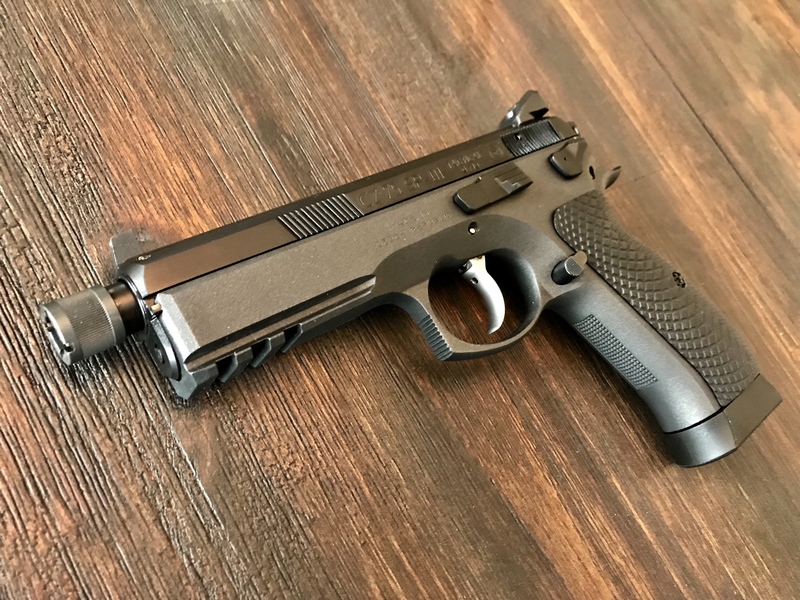 Re: My New Custom SP-01 Tactical Threaded!